I was actually texting about selling the metro with a guy last week. Then I moved it around the driveway, and CEL was on. I remembered that when I was driving it last it came on and was misfiring, which it occasionally does after a while and I replace spark plugs and it’s good to go for a while. I go to parts store and change plugs 3/ $7 with a gapper because who knows where I put it last time. I decide to put the scanner on it just in case, and it says something about O2 sensor bank1 sensor1. 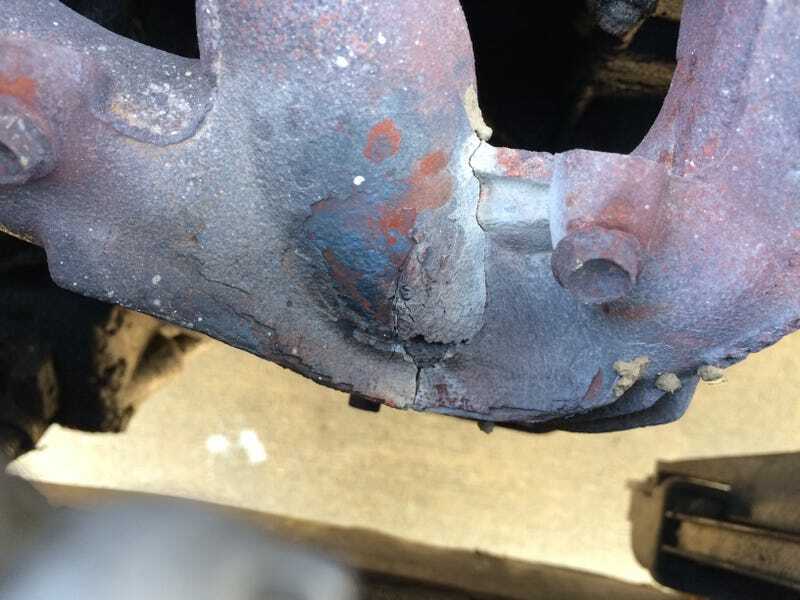 Then I get to looking at where sensor 1 is in the manifold and notice this crack under the heatshield that is just sitting on the mounting bolts. About $70 for a new manifold, not including the new bolts that go into the head as they are FUBAR and probably need to be cut off. And another $65 for an O2 sensor. Plates are up in December so I have until then to decide what to do with it. Although it still gets about double the Equinox MPG.